If you live in Oregon, you know we have a reputation for good beer and lots of breweries to choose from. It’s hard to stand out in the crowd, but Hopworks Urban Brewery has done just that by being the first Certified B Corporation brewery in the Pacific Northwest, a member of the 1% For The Planet, and a gold-level bike friendly facility. Not only does this family-owned and operated brewery have a mission to help the planet, but they have delicious beer and food as well. Organic malts and locally-sourced hops mean that quality is important and the prices aren’t too bad either considering what you get. Everyone wins. 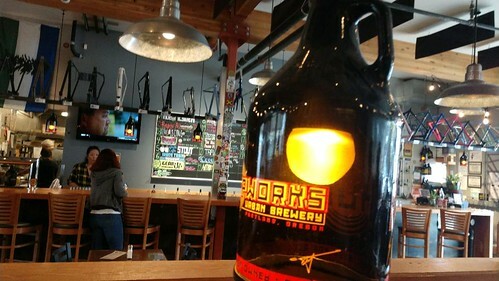 Hopworks has three locations to choose from. There’s the 7-barrel brewery in Vancouver, WA and two Portland locations, one on SE Powell Blvd and one at N Williams Ave. The N. Williams location has recently rebranded it’s BikeBar and has just launched it’s reopening under a new name. Hence the “Hopworks BikeBar” is out and “Hopworks North Williams Pub and Beergarden” is in as of April 2nd along with three new beer releases. Run Oregon was lucky enough to receive an invite to check out the place, as it’s gone through a bit of a facelift along with the new name. 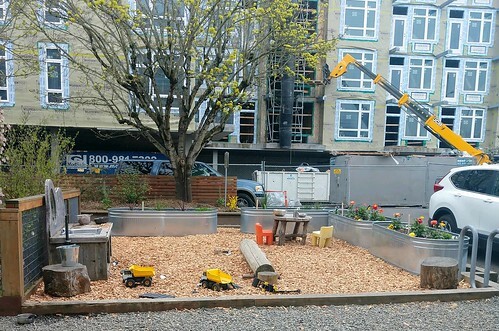 The North Williams Pub is on the ground floor of ecoFLATS, which is considered a pioneer in sustainable construction. There are 20kW of photovoltaic solar panels on the roof, as well as solar hydronic heating. The facility is also on the “bike highway,” which means that 3,500 cyclists ride by Hopworks every single day. However, I was told that the “BikeBar” name for the facility, which opened in the summer of 2011, was a bit confusing to people that didn’t know them, and some thought it might be a biker bar. This is much different than the vibe of a bike-friendly pub in Portland. So what you get is the new name, which is pretty self-explanatory now. I had never been to the location before the “refresh,” so I didn’t have anything to compare my visit with, but the place sure looked great. I was told that there was a new seating arrangement inside, along with the new signage and a fresh coat of paint. 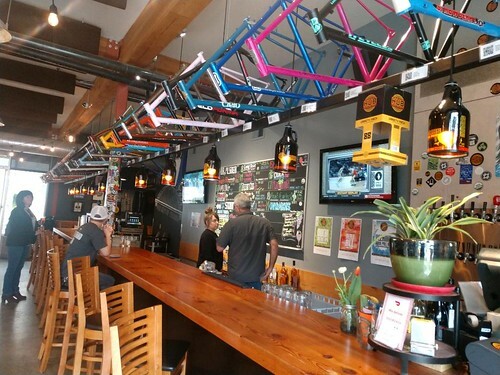 The first thing I noticed when I walked inside was all the colorful bike frames hovering above the bar. The space was clean and inviting, and a host came over right away and told me to sit anywhere I liked. I explored the inside of the place a bit and discovered it was a great space for people to come with kids. 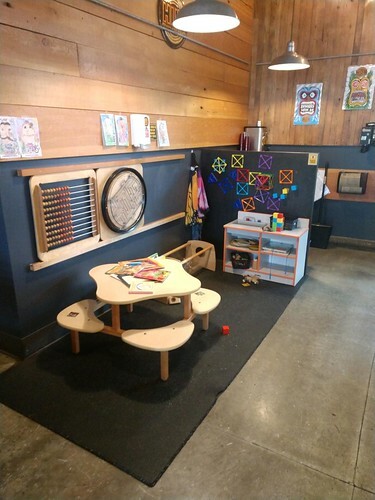 There was a small corner with toys to keep kiddos occupied while adults could have a much needed break in the day and it was a pretty low-key and relaxed environment. 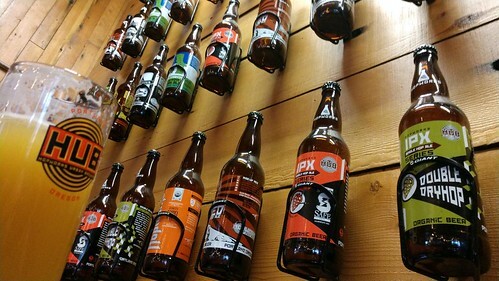 There was also a great “wall of beer” as I came to call it, with a ton of Hopworks bottles on display. It reminded me that this brewery means business and has been around the block a few times with their quality beers. I stepped out onto the back patio and was seriously impressed. 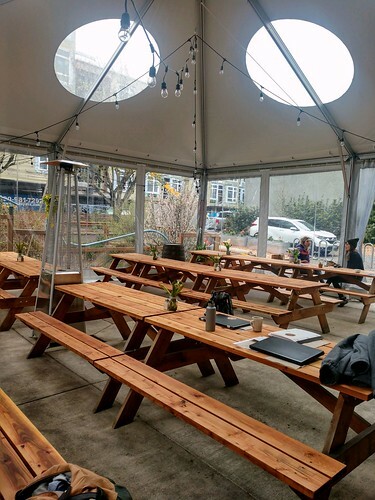 There was a large new tented and heated beergarden area with skylights and another kid-friendly space for children to explore. SpielWerk Toys were there that afternoon with arts and crafts, but I didn’t have my kids with me that day. I can’t think of many other pubs that have both inside and outside options for kids, and as a mom myself, it’s really something I would put a huge value on. If Hopworks was my neighborhood pub, I’d probably be there at least once a week. I had to leave before the DJ got there, but I’m sure it’s a pretty happening atmosphere. As previously mentioned, there were three new beers on tap. The first, called “Reply All,” is a hazy IPA brewed with Eldorado hop-hash, Idaho 7, Mosaic, and Strata hops with notes of pineapple, tangerine, and spruce. The second is called “Oceania,” and it’s an Imperial IPA made with Australian and New Zealand hops featuring waves of passionfruit, lime and papaya. It has been brewed with Dr. Rudi, Green Bullet, Vic Secret and Rakau hops. Finally, the “Ouch! Cactus IPA” is a light pink beer fruited with the prickly pear of the Nopal cactus. None of these beers were my choices that day, but they had a great selection of others in all sorts of flavors and colors. 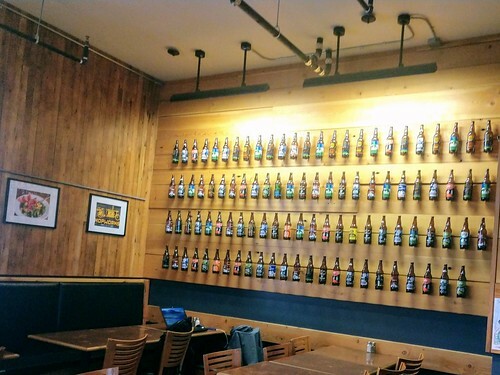 Any beer lover should be able to find a favorite here. Whenever my family is in this part of Portland, I plan to stop in at Hopworks. Not only was the beer I received really good, but the menu is filled with plenty of vegetarian and vegan options, which is really nice for someone like me who doesn’t eat meat. There are still plenty of options for meat-eaters as well and the happy hour menu is varied and excellent. It seems they’ve done a great job on the rebranding and refresh on the building and I hope they find great success here, because it’s certainly well earned.